This is a Ready to Run XB (Expert Built) radio control car of item 58522 Street Rover. The Street Rover was first introduced as a kit. It is now available for radio control car enthusiasts who are looking for a expert built kit from Tamiya's assembly line. 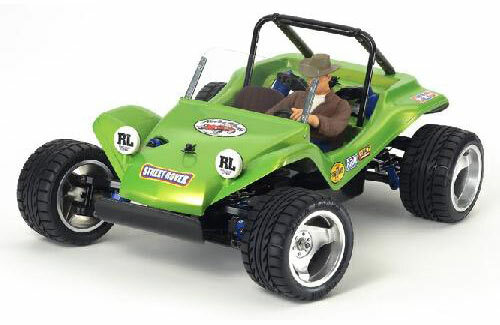 This is a ready-to-run Expert Built model of the Street Rover, an open-top on-road buggy featuring the reliable 2WD DT-02 chassis. • The durable resin dune buggy body has been beautifully finished in Candy Green. • Front and rear wide tread tyres are mounted on metal-plated wheels. • Finespec 2.4GHz R/C system is pre-installed.